Or so I thought anyway. That’s when I ran across Lynn’s Kitchen Adventures Asian version. It fits all the requirements, but isn’t exactly the standard soup you think of either. I probably wouldn’t have given it a try had it not seemed so perfect for this challenge either, so I’m glad it worked out this way. Turns out, it was delicious! 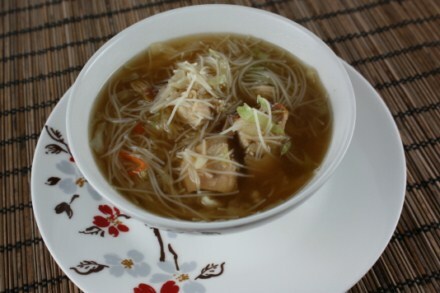 I must say, I really had my doubts about it, mostly because the ingredients are so simple and it doesn’t sit on the stove, simmering for a long period of time, which is a key step for soups in my mind. But anyway, let’s get to the food, huh? 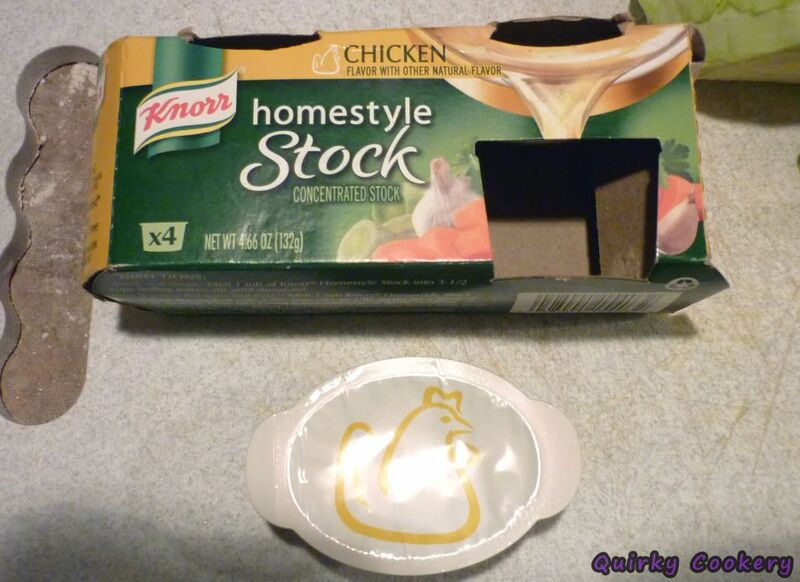 Normally I would have homemade chicken stock in the freezer, but I’ve been looking for an excuse to use up the last of these little Knorr stock packs I received at BlogHer this year. They’re actually a lot better than I thought they would be and don’t carry the overly salted taste that most premade broths do. And would you look at that?? I thought it’d be liquidy or maybe a dry block like bouillon cubes, but instead, they’re gel packs of sorts. 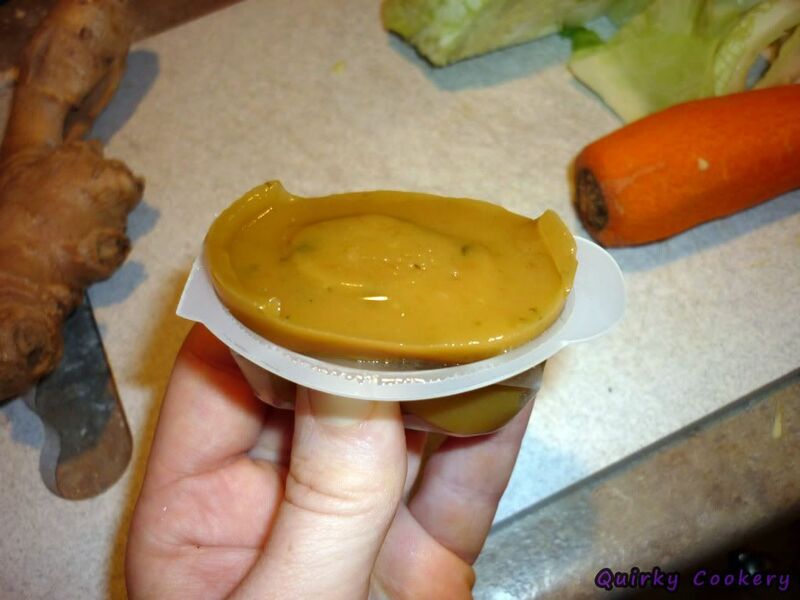 Almost like strange jello shots….of chicken stock. Weird, but easily dissolved and mixed. 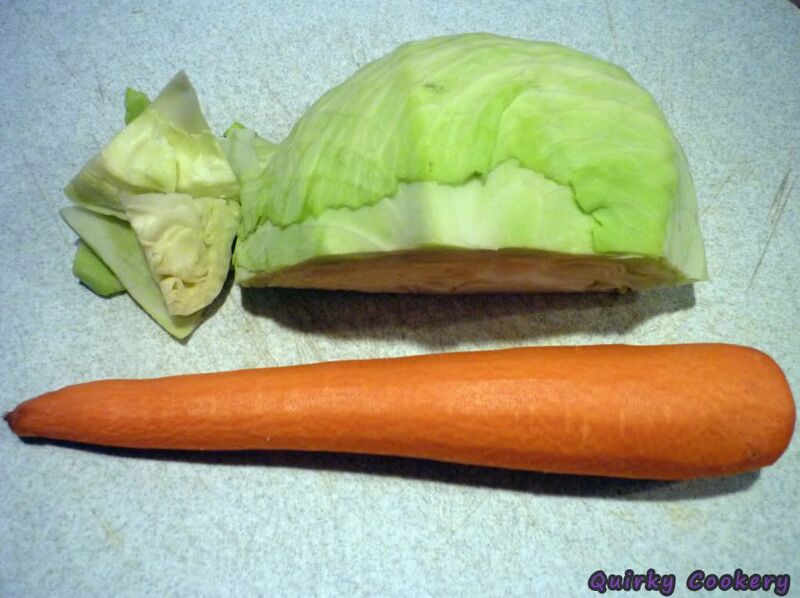 For the slaw, I just finely sliced part of a cabbage and carrot that was already in the fridge and on their last legs. 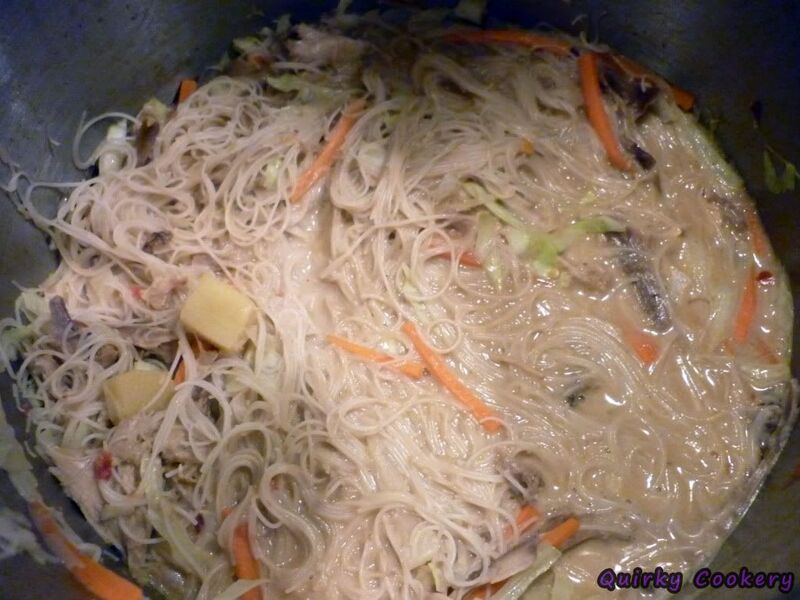 The cabbage in the final product wasn’t really even noticeable…it blended in entirely. It’s great for the bumping up the nutrition, but if you don’t have any on hand, it’s not going to make or break this recipe. The carrot added some nice color and texture, though. 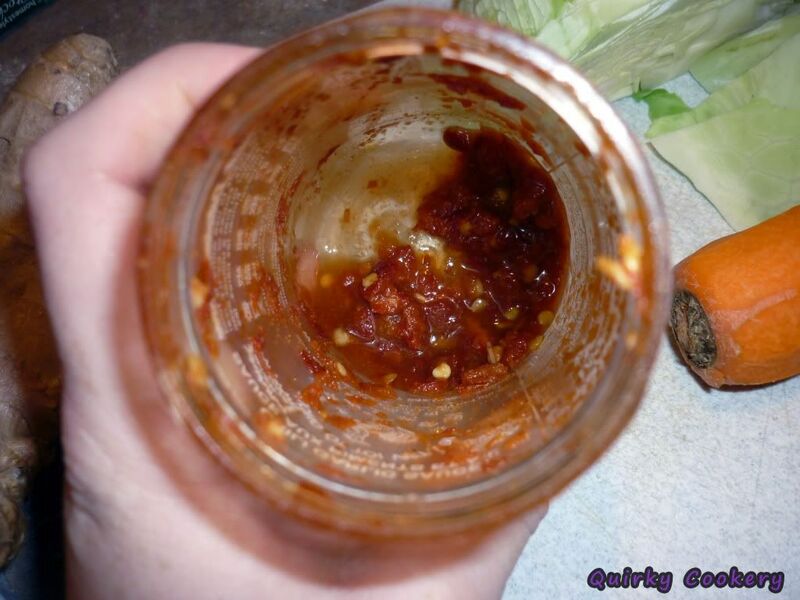 My “red sauce” of choice was chili garlic sauce that I’m savoring the bottom of the jar of. I love this stuff so much. 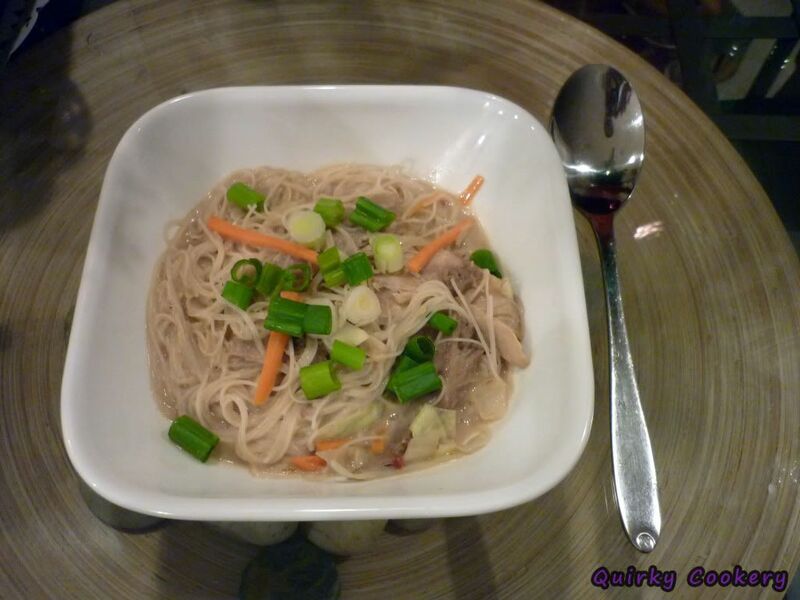 I added some both directly to the soup and more to mine after serving to give it some extra kick. 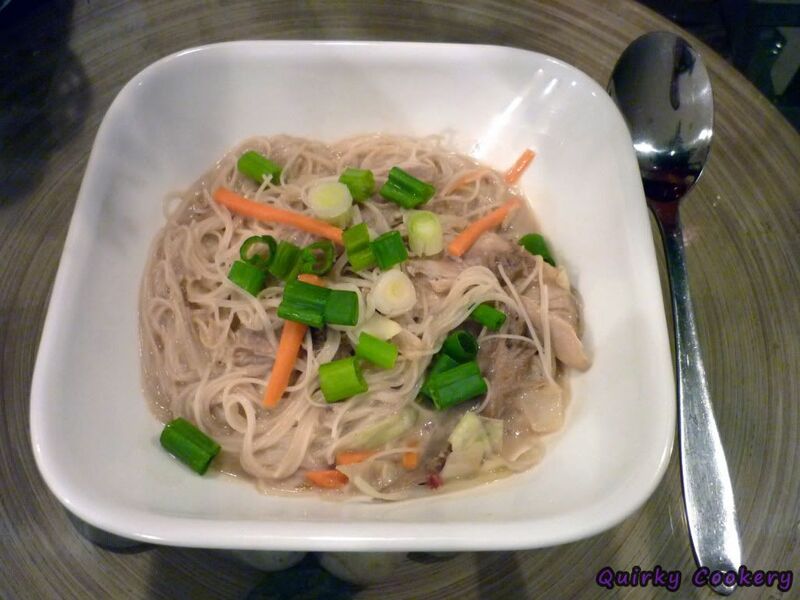 If you’ve never cooked with rice noodles before, they’re quite amazing. They’re really rough and crumbly out of the package…pieces will fly everywhere, even if you’re careful. Add them to water for a few minutes, though, and they become really soft and bouncy. Yes, bouncy, as in, if you drain off the water and toss them on the table, you’ll see them bounce. Go ahead, do it! But that’s not relevant to the recipe, so moving on…. 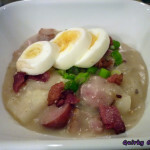 Alright, so really, it doesn’t *look* like the most appetizing dish. It’s this sickly gray color that even with some photo editing, doesn’t really look much better. But it tastes good and that’s what really matters. 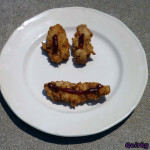 Be happy I spared you the grosser series of prep pictures that were more like this picture. The shadows actually make it look better. Ew! But it smelled delicious and I was starving so at that point, I obviously carried on. Tossing on more color really helped, so I’m happy I had green onions. Overall impression? It was better than I expected. It was really easy and fast to make, which made it even better. A little lemon or lime juice could really go a long way in kicking it up a notch in the flavor department, too. 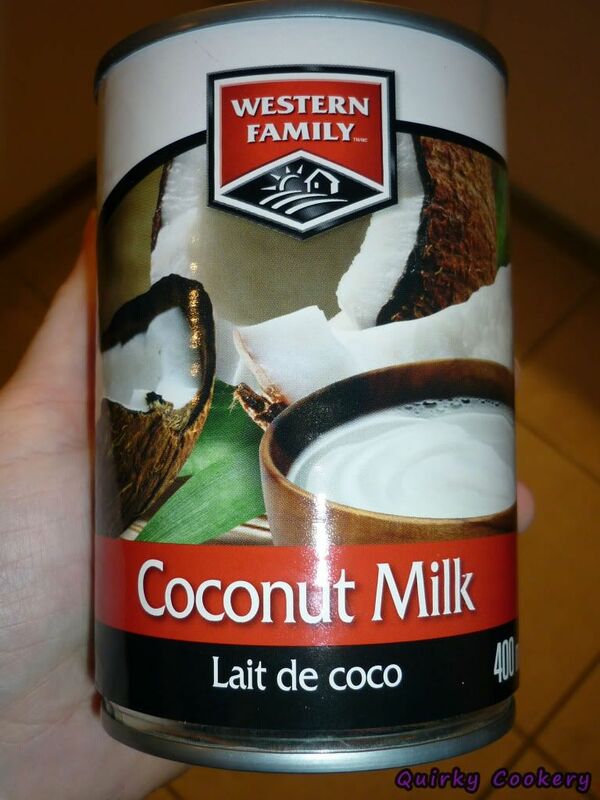 Oh, and I had never used coconut milk before because well, I really dislike coconut, remember? 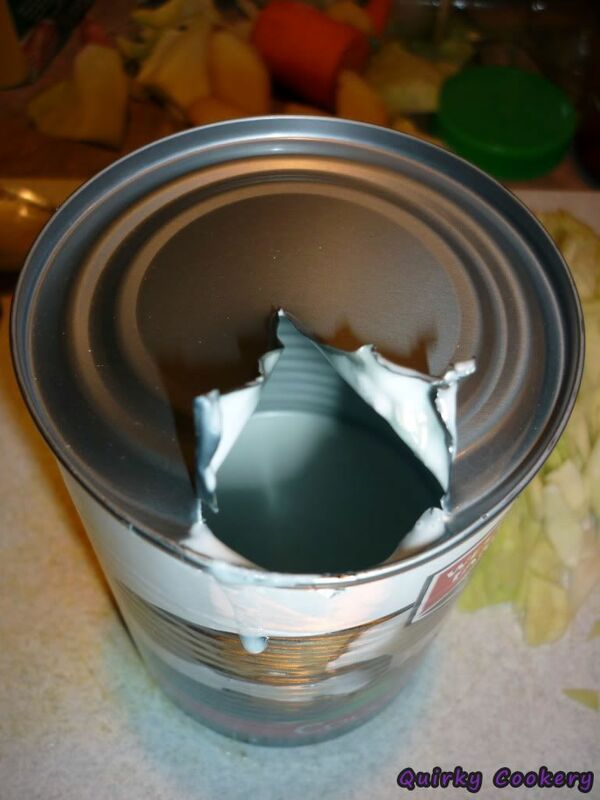 When the can was opened and the smell hit me, I started having even more doubts, but it added a creaminess that straight broth couldn’t…and it didn’t actually *taste* like coconut, so once the smell died down, I was happy with the results, hehe. I added more liquid to my bowl than what’s showing in the pictures and oh my god, I was so stuffed by the end. I had no idea it would be so filling. My version of the recipe ended up being for a smaller batch. Take note I didn’t just cut the original in half, and actually used almost the full amount of some of the ingredients anyway. 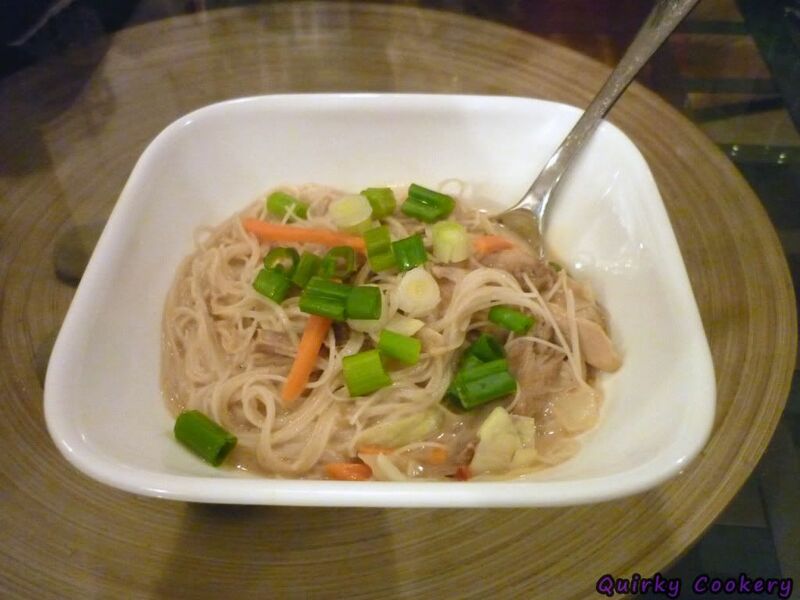 Soak noodles in warm water until you’re ready for them. 3 minutes is usually plenty, but it won’t hurt to let them sit longer. Heat chicken broth, coconut milk, soy sauce, and ginger to a boil. Let simmer for 5ish minutes. I let it cook a little longer to try to get more flavor out of the ginger…which still couldn’t really be tasted much in the final dish, so I would probably go even longer. Add chicken and let cook until everything is heated through. 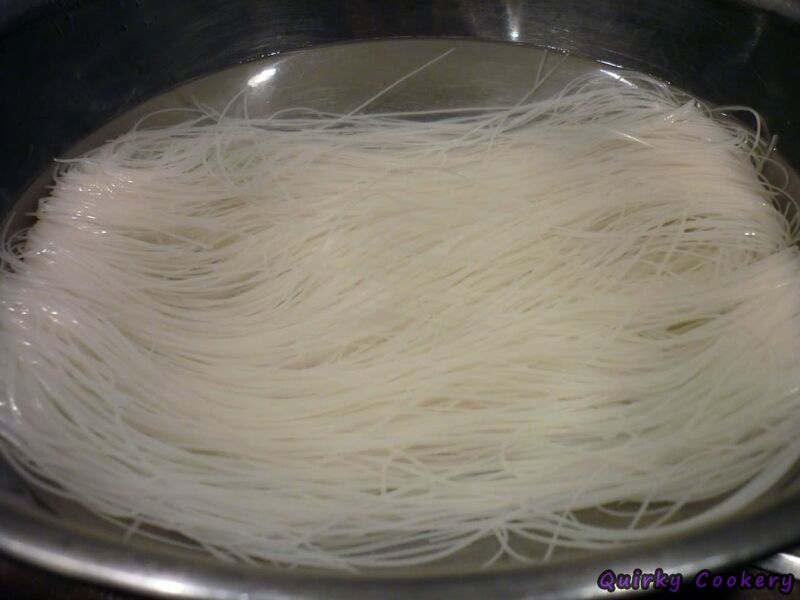 Drain noodles and cut into thirds using scissors or butcher knife. It’s a lot easier to eat this way. Add them to the soup, plus the cabbage mix. Let heat just for another minute or two, pull out the ginger pieces, and you’re ready to go. Add green onions, hot sauce, and some salt or extra soy sauce to taste. Remember to check out others at the Crazy Cooking Challenge. 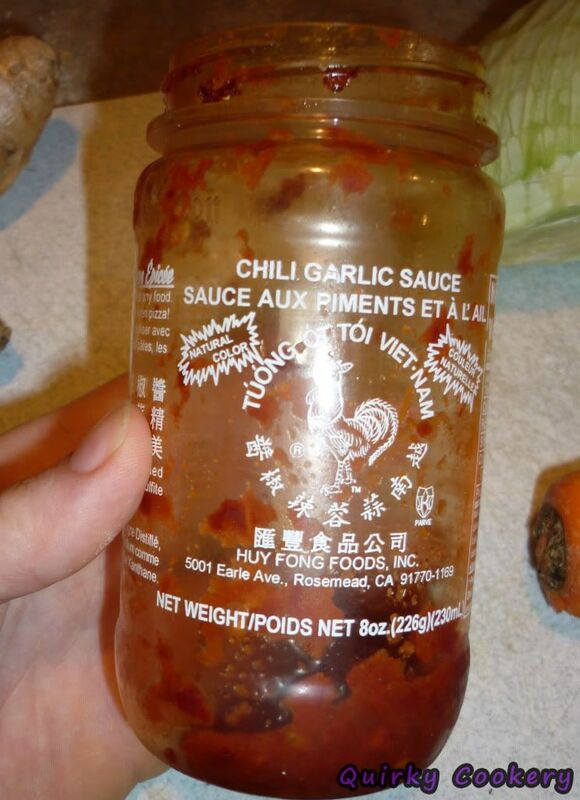 Yum, sounds like great flavors and I love anything with chili garlic sauce. this sounds and looks fabulous! I made the shaker chicken noodle soup. oh my gosh, this looks awesome! 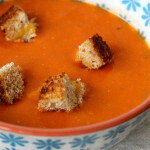 i love soups like this! 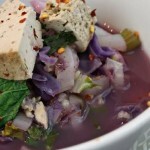 Love that your soup includes cabbage – one of my favorite veggies. 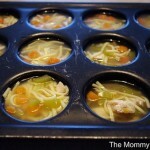 I hope you’ll stop by to visit my CCC post for Southwestern Chicken Noodle Soup. Take care! 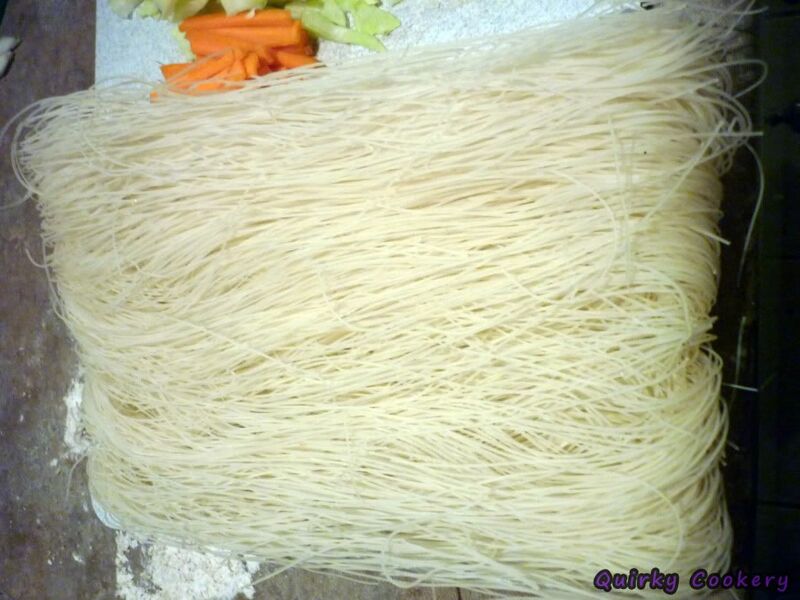 I agree with you about the noodles. They are fabulous. Your recipe sounds fabulous also and it looks that way, too. I agree, I was sort of hesitant to join this month because I wasn’t sure how unique it would be. You did great! 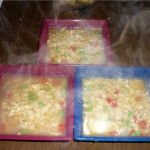 I think your soup looks delicious! I’m a newcomer to coconut milk and have fallen in love with the texture it brings to foods. Will definitely try this soup. 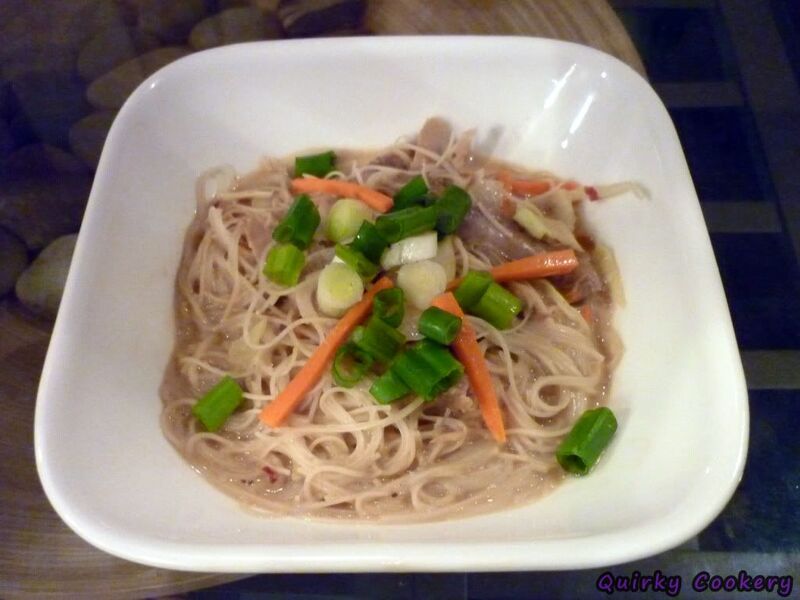 Have always wanted a reason to try rice noodles. Thanks for sharing…I’m #52 — a long, roasted, variation. I think both of these are equally as good! Thanks for participating with us! Too funny about your can opener, I would of never lasted! 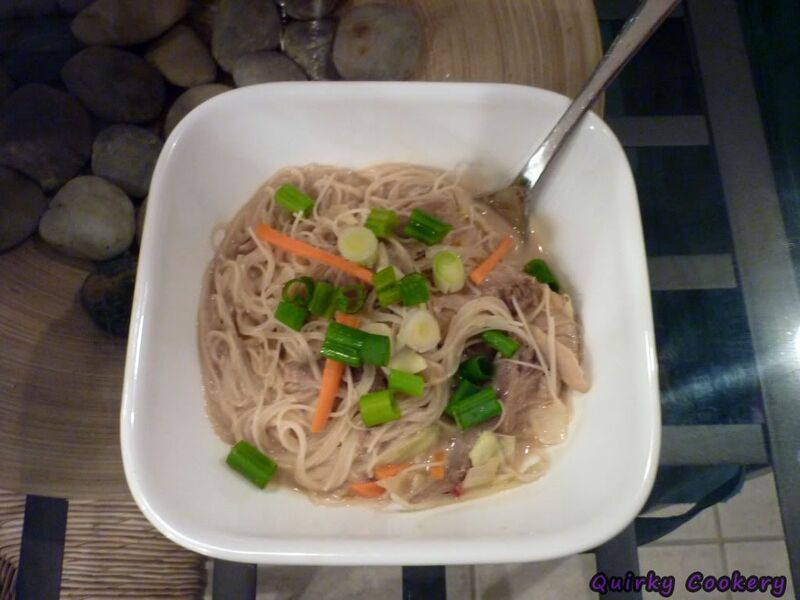 My recipe is #1 Creamy Chicken Noodle Soup – Come check it out!